Blowout Sale! 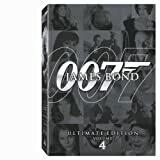 Up to 62% off on James Bond Store at Killer Movies. Top brands include , MGM, Fox Home Entertainme, 20th Century FOX Home Entertainment, Film4 Library, Fox Lorber, MGM (Video & DVD), TCFHE/MGM, 20TH Century Fox, & Sony Pictures Home. Hurry! Limited time offers. Offers valid only while supplies last. View more products in MGM Home Entertainment.